Since 2009, a diverse group of developing states that includes China, Brazil, Ethiopia and Costa Rica has been advancing unprecedented pledges to mitigate greenhouse gas emissions, offering new, unexpected signs of climate leadership. Some scholars have gone so far as to argue that these targets are now even more ambitious than those put forward by their wealthier counterparts. But what really lies behind these new pledges? What actions are being taken to meet them? And what stumbling blocks lie in the way of their realization? In this book, an international group of scholars seeks to address these questions by analyzing the experiences of twelve states from across Asia, the Americas and Africa. The authors map the evolution of climate policies in each country and examine the complex array of actors, interests, institutions and ideas that has shaped their approaches. Offering the most comprehensive analysis thus far of the unique challenges that developing countries face in the domain of climate change, Climate Governance in the Developing World reveals the political, economic and environmental realities that underpin the pledges made by developing states, and which together determine the chances of success and failure. David Held is Master of University College and Professor of Politics and International Relations at Durham University. Charles Roger is a PhD student at the University of British Columbia and Liu Scholar at the Liu Institute for Global Issues. Eva-Maria Nag is the Executive Editor of Global Policy at the London School of Economics and Political Science. 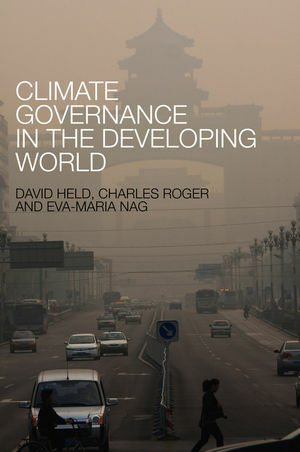 ?A well-informed and thorough account of how [developing] nations are managing their climate change policies?edited by David Held, Charles Roger, and Eva-Maria Nag?offers a helpful look at how these important countries actually behave." "Of great value to both the scholarly world and the policy world. The quality of the research is consistently high across all the chapters, and the editors have ensured an excellent degree of analytical cohesion." "An excellent reference for anyone concerned with the direction of climate policy in rising economies around the world." "This valuable book once and for all dispels the myth that developing countries are unwilling to take action to confront climate change. By disentangling the complex motivations and incentives facing policy-makers, and the obstacles they face, this is important reading for all who want to understand how all countries can be encouraged to become part of the solution to climate change." "This is a book of considerable value not only to governments and other stakeholders in the developing world, but to others across the globe as well. The principle of 'common but differentiated responsibility' really needs considerable analysis and interpretation for application in different parts of the world. This book very ably reviews global developments and developing country initiatives to highlight the choices, opportunities and challenges facing the developing world in the field of climate governance. Given the very readable material presented in these pages, I would recommend this piece of literature to anyone interested in climate issues across the globe." "The large developing countries are essential to the global effort on climate change. This book by people with deep expertise in each country tells us with authority what they are doing and how. High quality work on an important subject." "This volume is a thoroughly readable and utterly fascinating practical attempt to map climate governance in a set of important developing countries. It takes a significant step towards filling a sizeable, even cavernous, research gap."